Xaymaca is what the indigenous, Taino, called their island. In their native language, called Arawak, it means, “The Land of Wood and Water” or “Many Springs.” Christopher Columbus discovered the island on his second voyage to the New World. He landed there on May 5, 1494 and Jamaica remained under Spanish rule until 1655. By the 1600s, the Spaniards managed to wipe out the Taino population through slavery, and disease. As a result, the Spanish then transported enslaved, West Africans to the islands to work the fields. Christopher Columbus spent nearly a whole year on Jamaica after his ships were damaged by wormwood (which is actually a wood eating, saltwater clam), in mid-1503. While he was stranded, the Taino stopped giving him and his crew supplies, as they were torturing and pillaging the Taino people and the land. Columbus, being the navigator he was, had heard about a German astronomer, named Regiomontanus, who predicted that a full lunar eclipse would occur on February 29, 1504. He told the Taino that he would remove the moon and not return it until they gave him the supplies he needed. Needless to say, the plot worked, the moon went away and the Taino offered them whatever they needed to get the moon back. Forty eight minutes later he agreed, and the moon reappeared. From then on, he had all the supplies he needed until he was picked up by the caravel from Hispaniola, on June 29, 1504. In 1655, the English invaded Jamaica, defeating the Spanish colonists. However, the African slaves seized the opportunity and fled to the island’s interior, forming independent communities, known as the Maroons. The English built a settlement at Port Royal, which became a base of operations for pirates and privateers. In the 18th century, sugarcane replaced piracy as Jamaica’s primary source of income and the English brought in hundreds of thousands more African slaves to work the plantations. By 1800, black Jamaicans outnumbered whites by twenty to one. When the price of sugar dropped, it was replaced as the leading export by bananas and coffee. After the emancipation of slaves in 1834, the plantations were worked by indentured Indian and Chinese workers. British rule lasted until their independence in 1962 but there were numerous, bloody uprisings throughout this period. Jamaica joined the Commonwealth of Nations, an organization of ex-British territories and continues to be, what is called a Commonwealth Realm, with the British Monarch as Queen of Jamaica and Head of State. Kingston became the capital city in 1872 and remains so today. Jamaica is one of the islands known as the Greater Antilles, located 90 miles south of Cuba, and 100 miles west of Haiti, in the Caribbean. The island is made up of coastal lowlands, limestone plateaus and the beautiful Blue Mountains, in the east. The mountains get their name from the azure haze that settles around its peaks. Jamaica is known for its stunningly beautiful, white sandy beaches and all-inclusive resorts. Although, many people say that if you never leave the all-inclusive resort, you have not really visited Jamaica. Still, Jamaica’s tourism industry thrives and she hosts numerous cruise ships from many ports of call. Jamaica beckons to be explored: she offers incredible diving in the crystal clear, turquoise ocean, hiking the pristine plateaus and mountains replete with water falls, tropical foliage and wildlife, rafting through breathtaking rapids or floating along enchanting lagoons and discovering her underground caves, sink holes and underground rivers. Tourism accounts for thirty percent of Jamaica’s GDP. Some say the all-inclusive beach resorts hurt the locals who call Jamaica home. In Jamaica, outsiders can own the beach along with the property, stripping the land from its people. Efforts are being made to protect marine life, which seems like a noble cause, however, it forces the locals to go out further to reach the local catch, requiring more fuel, time and money. Jamaica has its challenges with high unemployment, poverty and a reputation for violent crime and drug trafficking, which is why the tourists are asked not to leave the resorts. If you do wander from the resorts, women will often be bombarded by merchants wanting to braid their hair into cornrows, as was popularized by Bo Derek, in the movie “Ten”. And you will often hear the locals say, “Yeah mon, no problem” in their kicked back Jamaican style, in response to almost any request. The famous novelist, Ian Fleming, had a beautiful five bedroom villa in Oracabessa that he named “The Golden Eye.” All fourteen of his “James Bond” books were said to have been written there. Today his home is part of a place for tourists to enjoy. The resort is now owned by Chris Blackwell, who was founder of Island Records and who brought the spiritual sounds of Bob Marley’s reggae to the rest of the world. Bob Marley’s music resonated with humanity, as it identified oppressors and stirred social change, while allowing listeners to escape their troubles and sway to its rhythmic beat. After Marley’s death in 1981, he was inducted into the rock and roll hall of fame. His 1977 album, “Exodus” was named “album of the century” by Time magazine. He was bestowed the Grammy’s Lifetime Achievement Award in 2001. Bob Marley’s music was rooted in his Rastafarian beliefs and he was known for smoking marijuana or “herb”, as it is called in Rasta culture. He was a believer of the herb’s medicinal, meditational and spiritual abilities. He once said “Rum, teach you to be a drunkard, and herb, teach you to be someone.” Bob Marley will forever be a Jamaican cultural icon. The Bob Marley museum is located in the capital city of Kingston. Jamaica was made famous on the world stage with its showing at the Calgary Winter Olympics in 1988. There, the Jamaican Bobsled Team competed against all odds in the Olympics. This was quite extraordinary for a team from the tropics who had never seen snow, let alone a bobsled. Since then, they have qualified multiple times in the Winter Olympics and were the inspiration for the movie about the trials and tribulations of the team, called “Cool Runnings”. Then there is Usain Bolt AKA Lightening Bolt, a Jamaican sprinter regarded as the fastest person ever timed. The small island of Jamaica is home to nearly 2.8 million people. The majority, about 80 percent, is overwhelmingly from African descent; many from the Akan tribe from Ghana and the Igbo from Nigeria. The balance of the population is Afro-European, East Indian, Caucasian and Chinese. The official language is English, however, it is a unique, creole dialect, called Patois. Religion is an important part of life for Jamaicans. More than 80 percent are Christians, practicing all forms of Christianity. There are also Jewish, Muslim, Hindu and Bahai religions represented. A very small percentage of the population is Rastafarian. According to the Rastafarian belief, the only true God is the late Ethiopian emperor, Haile Selassie and Ethiopia is the true holy land. Rastafarians are known for wearing their hair in dreadlocks, having beards and carrying bibles, as a sign of a pact with God. Rastafarians place great emphasis on spirituality, meditation and the individual. Ganja or the “herb’ is used in their religious rites. As we look into the cuisine of Jamaica, we can see it is influenced by the island itself and its rich history. It is a smorgasbord of sorts, yet there are many local ingredients that the island nation has made their own. The island’s motto is “out of many, one people” and it could be said for the food as well. They are probably most known for their fiery, hot, scotch bonnet peppers that are the key ingredient to any good “jerk” dish. 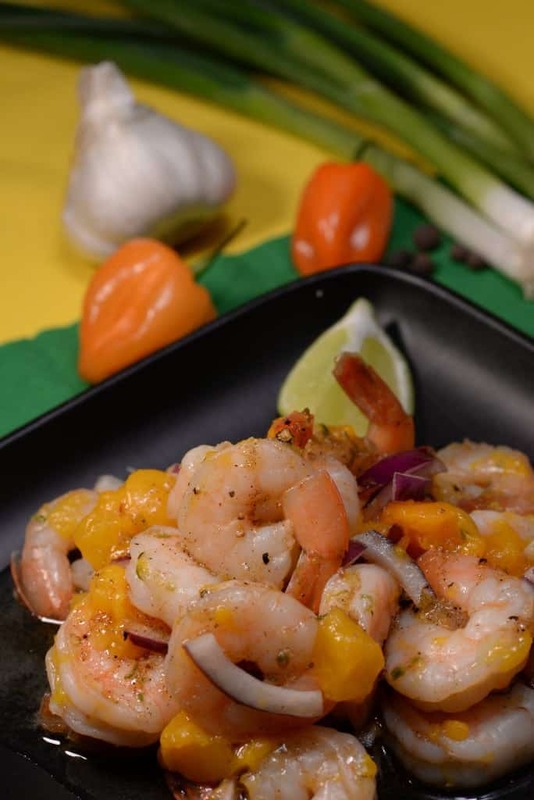 Although Jamaica is famous for their jerk chicken, it is saltfish with ackee, which is considered their national dish. Typically served for breakfast, this salted, cod fish is served with a most unusual fruit, called ackee. The fruit must be handled properly or it can be toxic. It is somewhat bland, yet has a sweetness that pairs beautifully with the saltfish. This is often combined with onions and peppers and served with callaloo, (a leafy bitter green) for a memorable meal. Plantains are often fried and served as a side dish. Another popular item, is the Jamaican patty; a street food loved all over the island. It is much like an empanada or samosa, but seasoned with the distinct flavors of Jamaican cuisine. Curried goat is also an extremely well-liked dish and rice and pigeon peas are the mainstay of the Jamaican diet. The rice is simmered in fresh coconut milk for a sweet, tropical taste. In Jamaica, tropical fruits are abundant and one is often greeted at the airport with a glass of tropical fruit juice mixed with rum (another island specialty) while reggae music plays in the background. It’s a lovely way to be welcomed to Jamaica. Allspice, is what ultimately embodies the flavor of Jamaica. There, it is known as pimento or Jamaican pepper. The pimento tree is indigenous to the Caribbean Islands. The wood from the tree is used to slowly cook their meats and fish to give them that distinctive Jamaican flavor. The fruit (or dried, unripe berry) evokes a blend of nutmeg, cinnamon and cloves. Allspice has a unique and unforgettable flavor. 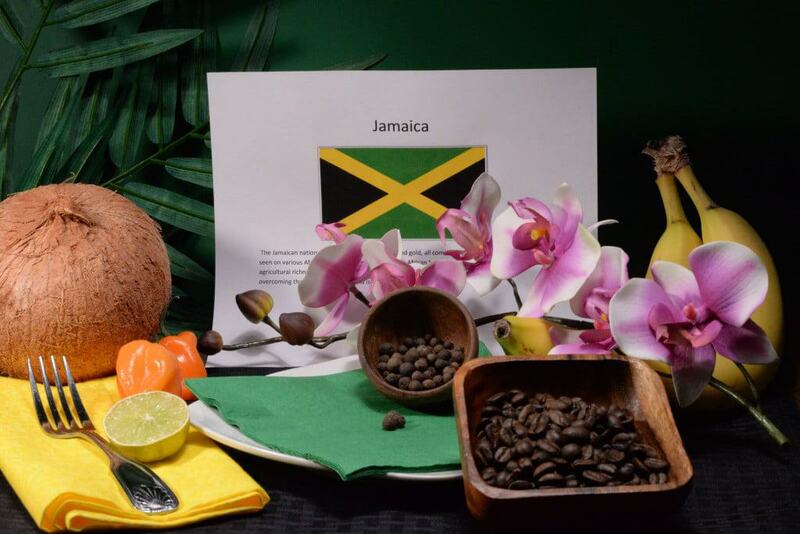 We set the table in the colors of the Jamaican flag; black, green and yellow. We put reggae music on the stereo to set the Caribbean mood. We decorated with bananas and coffee beans; two of the most important agricultural products of the island nation. Orchids were also on display, as Jamaica is home to over 400 varieties. Our first course was a hot pepper shrimp that was light and refreshing. It was served with fresh mango slices and red onion. This dish was plated cold and dressed with a jerk marinade that added the perfect amount of spicy heat to the dish. We enjoyed it with a hibiscus, iced tea. For the main course, we prepared their famous jerk chicken. We loved this intensely flavored but oh so tender chicken and now completely understand why Jamaicans are known for this treasure. 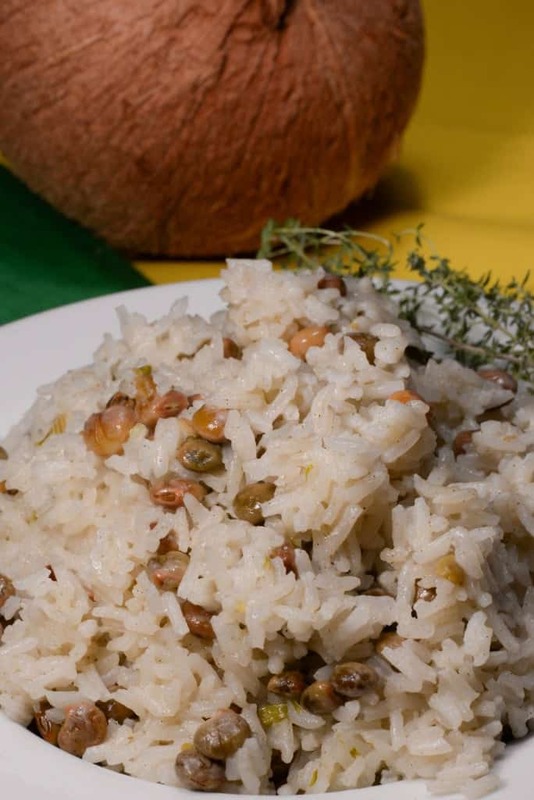 Served with the sweet, tropical flavor of the coconut rice with peas, it was superb. 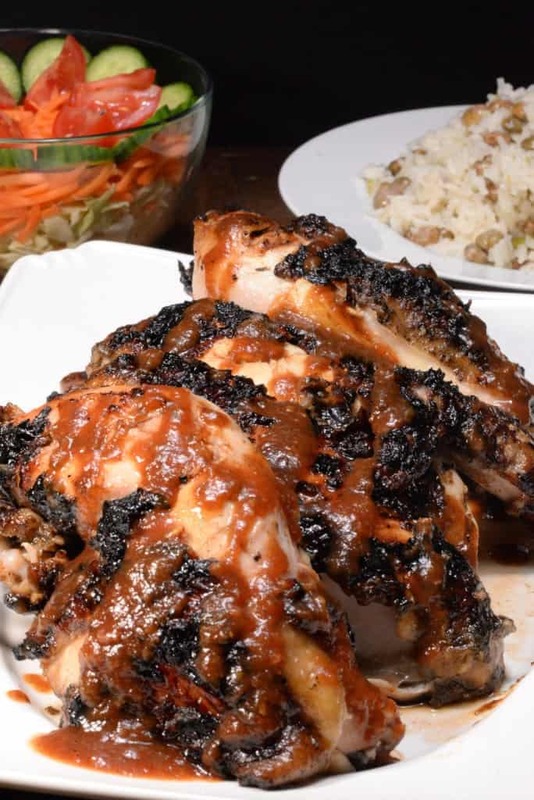 Jerk chicken is made in a couple of stages and requires making a base (or jerk) before the sauce is made, after which, the chicken is marinated in it overnight. While the chicken is grilled, it is also basted with the sauce, which is then placed as a condiment on the table. The base was what was used in the dressing for the appetizer course as well. (I love it when you can use a recipe for a number of different applications.) I can see many wonderful uses for the base called “jerk”. 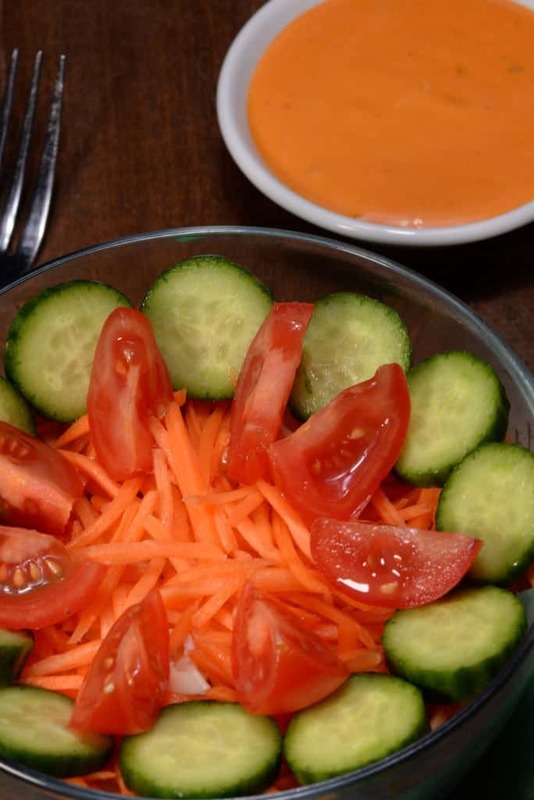 The chicken and rice were accompanied by what is known as a garden salad but it contains cabbage and carrots, as opposed to the usual lettuce. This was a lovely complement, typically served with Thousand Island dressing. 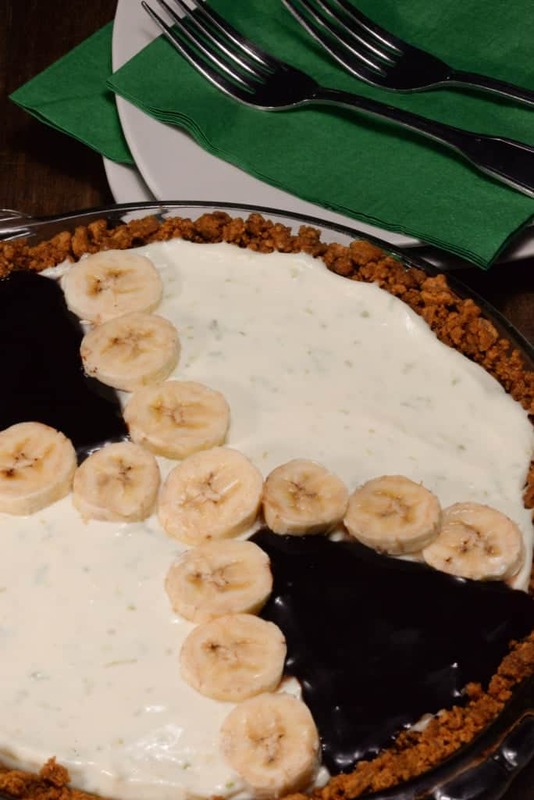 For dessert, we enjoyed key lime pie, which had a ginger snap crust and was decorated like the Jamaican flag, using bananas and chocolate on the lime green pie. We savored the dessert with a rich cup of Jamaican coffee from the Blue Mountains. Some say it is the best coffee in the world. I am not enough of a coffee connoisseur to answer that question, but it was delicious! As we say goodbye to Jamaica, I leave you with a verse from Bob Marley’s song called “One Love” His song was named “Song of the Millennium” by the BBC.